Rigid hinged knee wrap to provide medial and lateral support. Is the DonJoy Performance Dual Pinpoint Knee Strap Right for me? Need adjustable knee protection? 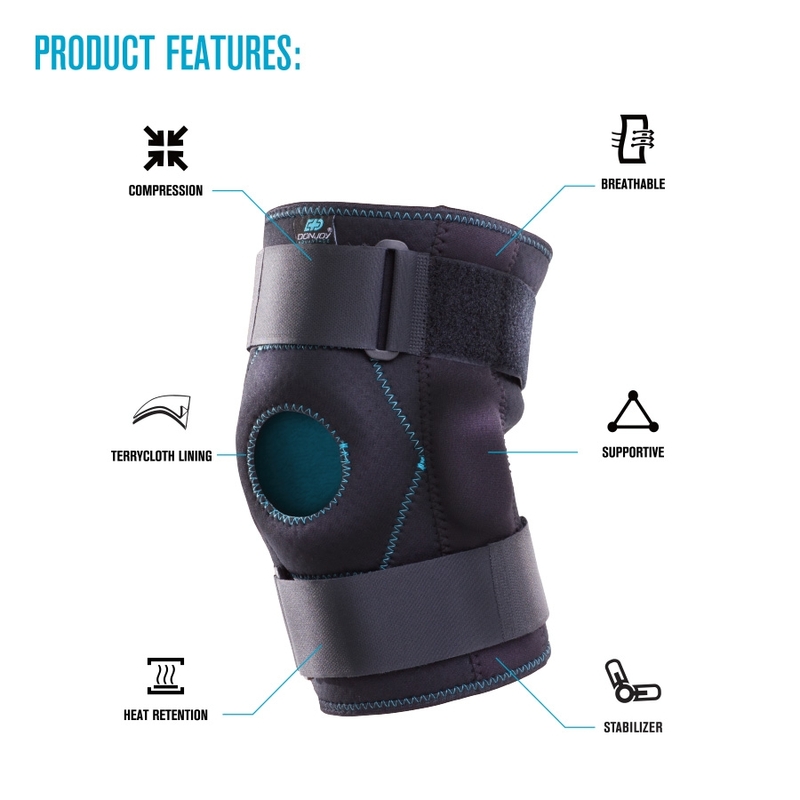 Whether you're dealing with a moderate knee sprain, strain, medial/lateral instabilities or arthritis, the DonJoy Advantage Stabilizing Hinged Knee Wrap is constructed to deliver medial/lateral and patella support. Designed with 4mm perforated neoprene material, this hinged knee wrap can help protect the knee during high-impact activities while providing compression to keep the muscles warm. As the knee heals, remove the aluminum hinges to ensure proper knee protection and fit. The Stabilizing Hinged Knee Wrap is durable and long-lasting. The DonJoy Advantage Stabilizing Hinged Knee Wrap is a hinged knee wrap that provides knee stabilization with medial/lateral support. Constructed with neoprene fabric, this brace delivers warmth and compression to help reduce swelling and soreness while the terrycloth lining delivers comfort and moisture absorption. The removable aluminum hinges allow you to personalize the level of support you need as the knee heals. Secure the top and bottom straps to your liking for additional compression and to prevent slippage. The Stabilizing Hinged Knee Wrap is easy to apply and can be worn on the right or left knee. Center the brace and knee cut out over the knee cap. Wrap bottom flap and then top flap behind the leg. Secure the bottom and top straps. Adjust as needed. To clean, remove hinges, hand wash in warm water with mild soap, rinse thoroughly and air dry. Inches 13 - 15" 15 - 19"
Size is based on the knee circumference. Measure around the center of your knee. Instructions Place the brace on the back of your knee, then wrap it around your knee. Make sure the knee cap is centered in the patella opening. Secure the bottom and top straps. Adjust as needed. I have been using the brace during my training and I LOVE IT! I train in full mixed martial arts including submission grappling, and the brace has been great. I'm talking about sparring, kicking, wrestling, etc. I'm doing all of that during any given training session, and I have been using the brace the whole time. I don't even think about the brace when I'm training because it is so comfortable and unobtrusive. I think it gives me the support I need because I have completely avoided injury or or aggravating my current knee problem. So thank you so much for helping me out. I'm always looking for a simple well constructed brace to use for skateboarding. The don joy bionic knee brace, has been the best hands down, but is a bit bulky. So I tried the advantage for its simplicity and price. Unfortunately I had to keep pulling down my pants to adjust and tighten this brace, even before I started sweating. Might be a good choice For just daily light activity. Pros: Well constructed, slim, inexpensive . Cons: Slippage. Also the strapping system is a bit annoying while putting it on for the first time. This is great for what I needed. I had a mcl tear years ago. This lets me play soccer with knee stability and i hardly know it's there. Serves the purpose. Thumb up.